President Maithripala Sirisena views the March Past. 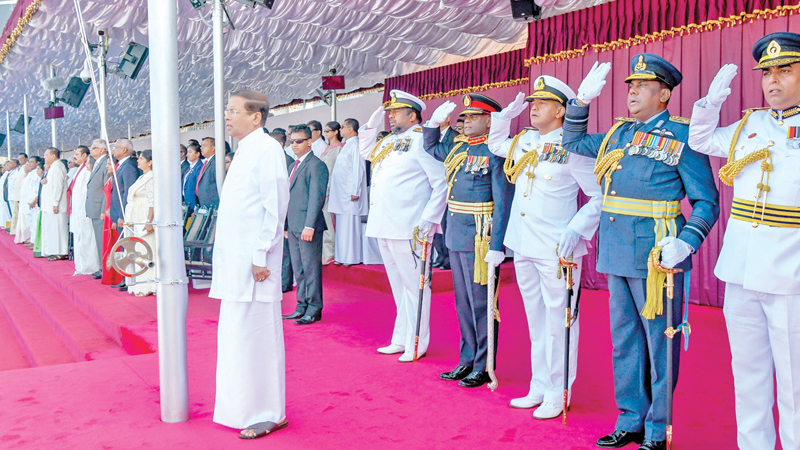 The 71st National Independence Day ceremony was held at the Galle Face Green yesterday under the patronage of President Maithripala Sirisena and Prime Minister Ranil Wickremesinghe. Maldivian President Ibrahim Mohamed Solih and First Lady Fazna Ahmed attended the celebrations as the Guest of Honour at this year’s National Day celebrations. Opposition Leader Mahinda Rajapaksa, Speaker Karu Jayasuriya, and many other parliamentarians, diplomats and military officials attended the event. Here are some highlights.